One of the major hot-button issues in our recent economic climate has been jobs. Who has jobs? Who doesn’t have jobs? How can we create more jobs? Well, here’s one thing that you may not have realized: Tourism and travel is a major source of employment in the United States, and not only in just the areas known to be major tourism spots! Travel benefits the local economy, businesses, and communities. As a whole, travel and tourism in America supports 1 in 8 jobs. It is easy to see why, too. Whenever tourists come in to visit there are several forces at work. The transportation that they use is supported by drivers, pilots, manufacturers, and the construction crews that build and maintain the roads and other modes of transportation that they use. Travelers will be using all kinds of services and entertainment once they reach their destination. Behind these services are the local businesses that support them such as banks, farms, schools, etc. Everywhere along this line are jobs, jobs, jobs! The US Travel Association tells us that in 48 out of the 50 states travel is a top ten employer! In Morgan County, spending by visitors topped 44.42 million dollars for 2012, up 4.7% from 2011. Tourism alone supported 280 new jobs in Morgan County! Tourism is very much alive, and marketing and promotion efforts are working. The numbers show that our efforts do generate dollars. Another huge benefit of visitors to our community is the tax revenue generated. 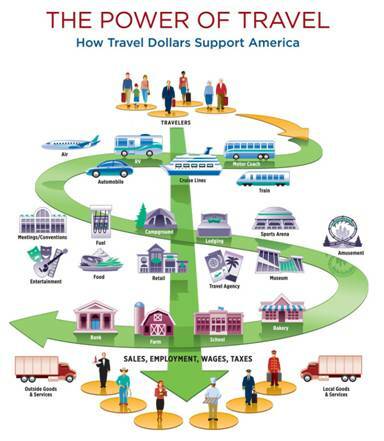 Not only are travelers helping to support jobs in our area, but they are, of course, bringing their money with them to spend! On average, each US household would pay $1,100 more in taxes if the revenue generated by travel did not exist! I’ll bet that helps you appreciate visitors to our area a little more! Sometimes it’s easy to equate tourism with big amusement parks, famous landmarks, or natural sight-seeing. We have a lot to offer visitors, whether we are their final destination or a stop along the road. Some of the things we have to offer are sporting activities such as fishing and baseball, many theatre and arts functions, unique shopping and dining, fun events such as Grierson Days and Cruise Nite, and much, much more! Our lodging facilities here in Jacksonville are never empty! We here at the JACVB are proud and very happy to be celebrating National Travel & Tourism Week in Jacksonville! Remember that whenever you are traveling and you fill up your gas tank, or stay in a hotel, or eat at a local restaurant, or even buy a hotdog from a roadside stand, you are supporting a local community. Also, your job could be helping provide a service to some travelers to our area! It can be easy to overlook, but please take a moment during National Travel & Tourism Week to appreciate all that travel and tourism have to offer our own local community!